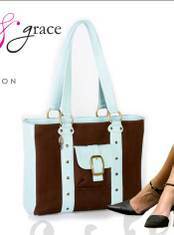 Functionally chic women’s laptop bags are hard to come by. One of my biggest complaints, and I’ve heard this from my friends too, is finding a women’s laptop bag that’s both feminine and functional. Most business women don’t want to carry around a pink briefcase with flowers on it, or lug around a bag meant for a 6ft tall man. And why does it seem that most women’s laptop cases don’t have shoulder support? Men have so many cool options; they can go, techy or sophisticated, casual or urban. All they have to do is walk into a store and find a plethora of laptop bags to choose from. I have gone on a search and found some pretty good options. My favorite is the bag by Hayden Harnett. It’s not stiff like a lot of the laptop bags for women that I’ve seen, and it has a long adjustable shoulder strap. What it is: The sister website of Zappos.com that specializes in couture handbags, shoes and apparel. Why we love it: As much as we love the fashion steals at Zappos.com, I really love snagging a deal on an Isabella Fiore handbag or a Jean Paul Gaultier dress. 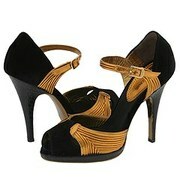 CoutureZappos.com carries designers like Kate Spade, Furla, Marc by Marc Jacobs, Goldenbleu, and Roberto Cavalli. What’s not to love? Discounted Designer Clothes in NYC: Does it get any better? What do Rebecca Taylor, Chloe, Balenciaga, and Marc by Marc Jacobs have in common? Other than being among my favorite designers, they're also appearing at Lucky Magazine's "Lucky Shops" on October 26-27 in New York City for two days of fabulous SATC style shopping (cocktail in hand of course!). Shop elite designer collections marked up to 70% off! Don't you just hate it when you find the perfect pair of jeans and have to wait for them to get hemmed? Well this event is all about instant gratification. Find a sweet pair of denim and get them hemmed on the spot! There’s no shame in zoning out on a Sunday afternoon watching the pre-Oscar special on E! Unfortunately, all those martinis the night before caused you to doze in and out of a splendid nap. In between dreams of Leonardo DiCaprio you caught snippets of seemingly useful fashion and beauty advice (imagine that, information you can actually use from a celebrity gossip station).